We feel really happy with such customer feedback and work with more enthusiasm for better user experience. To know more about Sou Mizobuchi contact him via his LinkedIn profile. Let’s see what Shurel Reynolds is talking about uCertify! Thank you Shurel for taking out your time and providing feedback. We are really delighted to hear this and it encourages to work with more enthusiasm to provide best to our customers. To know more about Shurel, contact her via Linkedin profile. 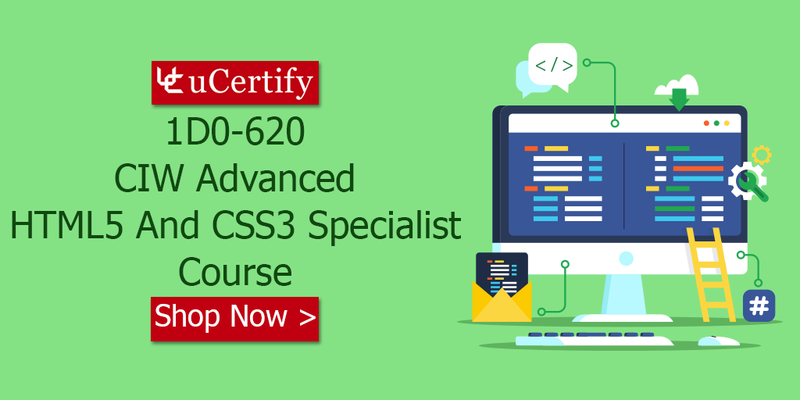 Start your prep for the CIW 1D0-620 exam and get the CIW Advanced HTML5 & CSS3 specialist 1D0-620 certification. The uCertify study guide will help you learn all the key concepts required for passing the 1D0-620 exam. Posted in Advanced HTML5 and CSS3 Specialist, CIW, CSS, HTML. Are you interested in starting a career in the field of UI designing? Then you should go for the CIW User Interface Designer certification that will help you showcase your UI designing skills. The certification is a part of CIW Web and Mobile Design Series certification. The certification requires you to pass the 1D0-621 exam. If you are worried about passing the certification exam? Then don’t be, uCertify is here with its comprehensive courses and interactive learning resources that will help you prepare for the exam. We offer CIW: User Interface Designer course that will help you gain an understanding of the critical importance of user interface design. 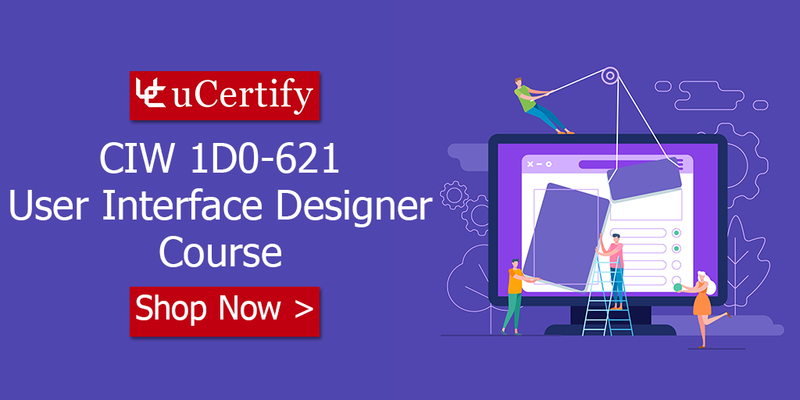 The CIW User Interface Designer 1D0-621 study guide provides complete coverage of the 1D0-621 exam objectives and provides knowledge and skills user-centered web design, user interface design principles, color, typography, layout, and wireframing, and a lot more. The CIW User Interface Designer 1D0-621 cert guide will also help you learn industry-standard methods for how to approach the design of a user interface and key theories and frameworks that underlie the design of most interfaces you use today. Aren’t you excited about getting the certification? Start preparing for the CIW 1D0-621 certification exam with the uCertify cert guide. Posted in CIW, User Interface Designer. How To Pass The CIW Perl Specialist 1D0-437 Exam? Do you want to become Perl Specialist certified? Then CIW Perl Specialist certification can be a good move for you. As you know the demand for the certified professionals in many modern and challenging areas of business, qualified is very high. The reason behind this is technological systems is continuously getting modified and need to be maintained and advanced to stay in line with business objectives. This certification will provide career advancement in the leading IT fields. Learn everything there is to know about the Perl programming language and scripting with our 1D0-437 CIW Perl Specialist course. The CIW Perl Specialist cert guide covers all the objectives of the 1D0-437 exam and includes topics such as basic syntax and control structures needed to write Perl scripts; data types, flow control, arrays, and hashes; regular expressions, and subroutines; and much more. The 1D0-437 comprehensive study guide will help you learn all the basic and advanced concepts of Perl programming language and impart essential skills required in today’s job market. CIW Perl Specialist certification is a vendor-neutral industry supported credential. 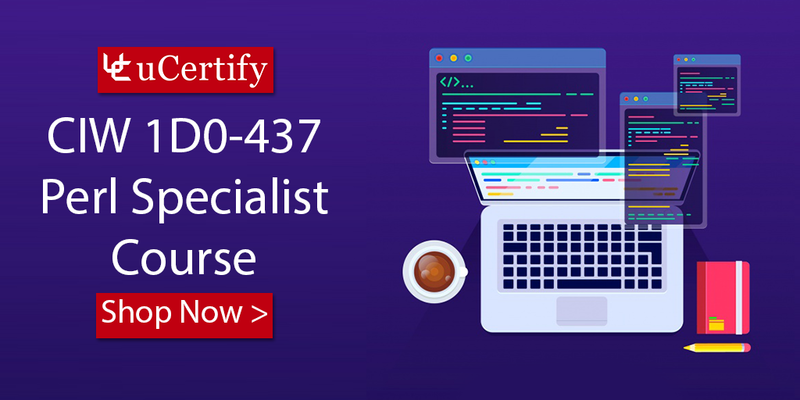 The CIW Perl Specialist 1D0-437 certification exam covers the use and operation of the Perl interpreter, including but not limited to: basic scripting, print function, variables; directs program flow using statements, loops, and Boolean expressions. It also includes the use of regular expressions to search and manipulate strings; arrays to store and manipulate program data; and many more. So, now when you have all the information regarding the certification exam, its benefits, and everything, you should prepare for the certification exam. Get yourself enrolled in the uCertify cert guide and pass the CIW Perl Specialist 1D0-437 exam. Posted in CIW, Perl Specialist.